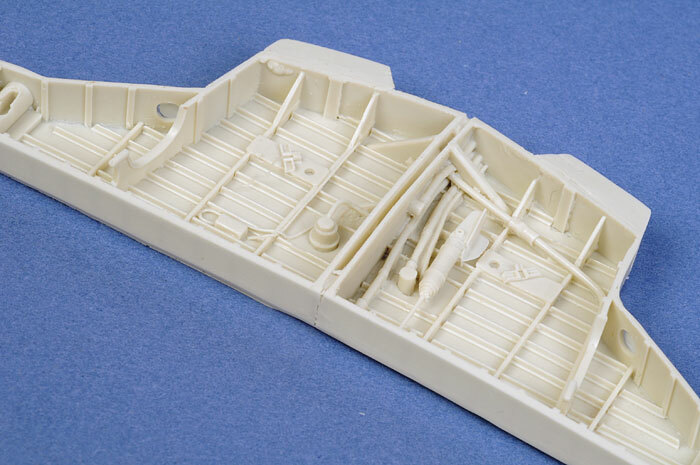 So, you bought Hobbycraft's 1/32 scale Sea Fury and you are disappointed in the poorly detail cockpit, wheel wells, landing gear and propeller / spinner? Fisher Model & Pattern released a truly spectacular multi-media 1/32 scale Hawker Sea Fury FB.11. The model was accompanied by an equally breathtaking but entirely appropriate price tag of USD$195. It is perhaps unfair to compare this premium quality kit with Hobbycraft's offering at one fifth of the price. Some modellers will be happy to ignore the shape and detail issues with the inexpensive Hobbycraft kits. Others, however, will be looking for ways to improve the Hobbycraft kit. Fisher Models has now come to your rescue with three new accessory sets. All three sets are cast in Fisher Models' familiar pale greenish-yellow hard resin. Surface detail on all the parts is perfectly smooth, and casting quality is excellent. Only minimal cleanup of the resin parts will be required. Some light resin flash is present on some pieces, but others are ready to use straight from the box. 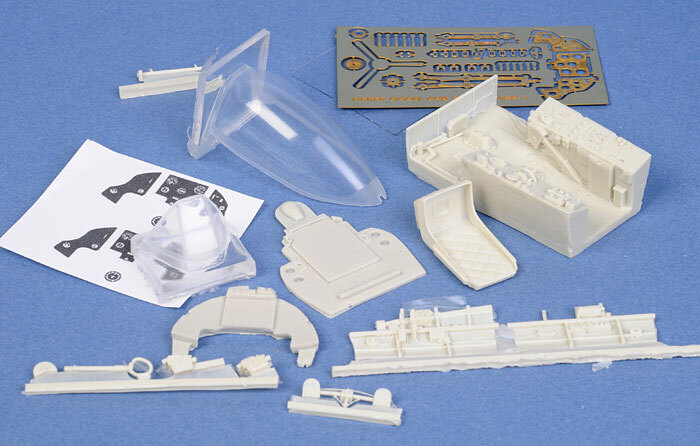 This complete replacement cockpit comprises 12 parts in pale coloured resin, two parts in clear resin, a sheet of printed instruments, a clear acetate sheet and a fret of photo-etched parts. Detail is stunning. The cockpit tub is a masterpiece, with a massive amount of busy detail cast onto the top and side of the consoles. The quilted backrest on the pilot's seat is very well done too. Sidewall detail is noted as optional in the instructions, as much will be hidden inside the small cockpit opening, but it would be a shame not to install them. The photo-etched fret supplied a tripod base for the master compass, the instrument panel face, plus various cockpit wheels, handles and smaller details. 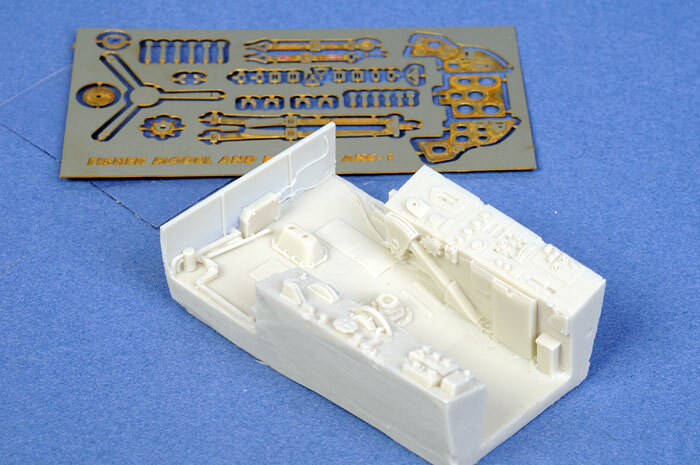 The instruments themselves are printed onto a sheet of paper, which will be glued to the rear of the clear acetate sheet and the instrument panel. A complete replacement canopy is also supplied in clear resin. This looks a little cloudy straight from the box, but it will sparkle after a bath in Future floor polish. The instructions note the changes required to the line of the kit windscreen mount to fit the accurately shaped resin windscreen. The shape of the sliding bubble section is also a vast improvement over Hobbycraft's attempt. Some minor cutting and grinding of the kit parts will be necessary to install the resin replacements, but the effort is well worthwhile. The title of this set undersells it somewhat. The contents include not only the main whee wells, but also complete replacement undercarriage legs, main wheel, tail wheel, all gear doors, tail wheel strut, cannon barrel stubs, tail hook and footstep. This set is made up from 38 resin parts. Once again, casting is perfect and detail is just remarkable. The large main wheel well is delivered with almost all of the busy structural detail cast in the one piece. 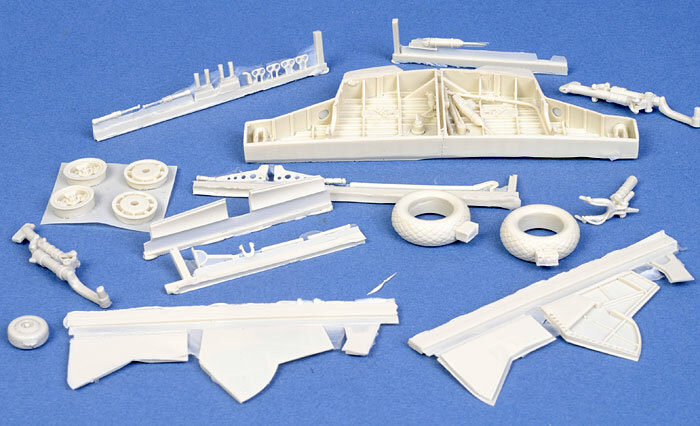 This set will have a big impact on the wheel well and exterior of your Hobbycraft Sea Fury. 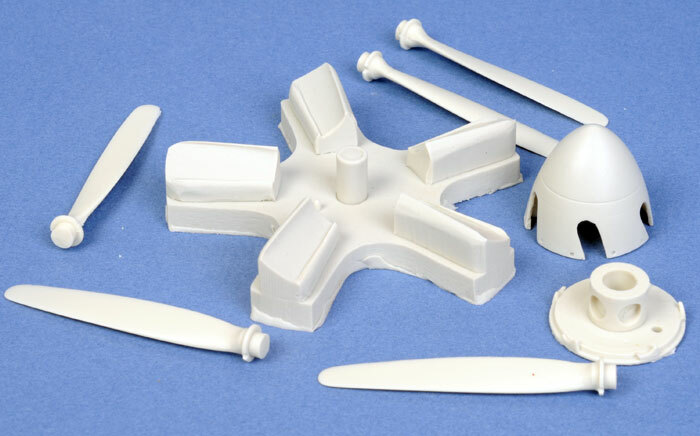 This is a simple replacement for Hobbycraft's misshapen spinner and propeller blades. Eight parts are included, including an assembly jig. The jig will ensure perfect alignment and identical pitch for the five propeller blades. 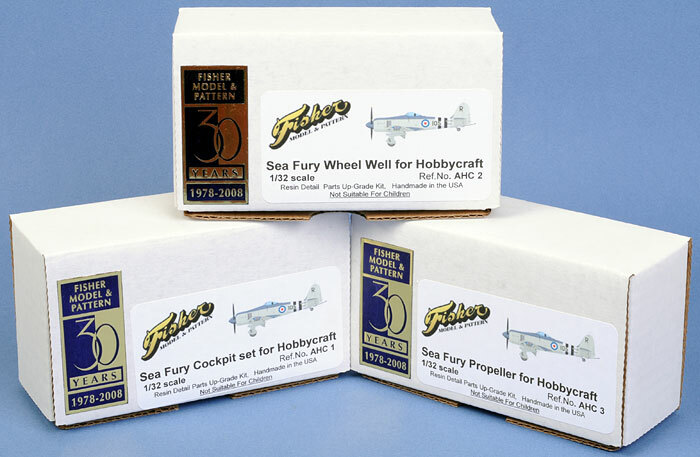 If you purchase all three Fisher upgrade sets plus the Hobbycraft Sea Fury kit, you will be spending around $115.00 - a little over a half of the price of the Fisher Models Sea Fury. The result will be a model with a high level of authenticity in the important areas of the cockpit, windscreen, canopy, wheel wells, undercarriage, a much improved nose with the replacement spinner and propeller blades, and enhanced exterior detail. The two main areas that remain unaddressed are the heavy surface detail (filling, sanding and rescribing will be the order of the day here), and the wing's incorrect airfoil. Even so, Fisher's 1/32 scale delivers a massive improvement to Hobbycraft's 1/32 scale Sea Fury.